and really easy to make! 1. Spread icing onto your round cookie. 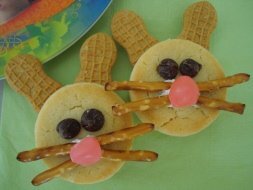 If you have peanut sandwich cookies you will need to twist them apart and press into the icing to make the bunny's ears. 2. Put a small amount of icing on the cookie where you want the eyes to be, press chocolate chips into the icing. Put a glob of icing under the eyes and press pretzels into the icing for whiskers, leaving a little bit of room in the middle. Add your round candy on top to make the nose and you're all done! We used shortbread cookies, but any kind of cookie will do. You can buy peanut sandwich cookies and just separate each half for the ears, but try to find the 100 calorie pack of peanut cookies, they are single cookies.